This 53-year-old woman wanted to repair her severely worn teeth. Due to her significant malocclusion (Class II division 2) presenting a deep overbite to the point where her upper incisors covered the lower incisors completely, her general dentist did not believe that it was possible to “restore” the worn teeth properly while keeping the same occlusion. The experienced dentist had realized that restoring teeth affected by so much wear, while keeping their initial position, was doomed from the beginning. He therefore proposed to use orthodontics to correct the occlusion, change the relationship of the anterior teeth, improve the vertical dimension (overbite) and thus make it possible to offer an appropriate and viable prosthetic solution to the patient in order to restore the severely worn teeth. (A) Occlusion at the beginning of treatment; the upper incisors are tipped inward and overlap the lower teeth completely and a part of the gum. (B) Severe wear is easily visible when the mouth opens. The crowns of the lower incisors are shortened by almost 50%! (C) Orthodontics: Due to the excessive overbite, a removable bite plane was used in the upper arch (D) to give support to the lower incisors when the mouth closes and to avoid having the upper incisors bite the brackets of the lower incisors and debond them. Elastics (C, E) are used to bring the teeth of both arches closer together and enlarge the lower arch. To learn more on the use of bite planes and disclusion in orthodontics. (F) Once the posterior teeth touch each other, which usually requires between ± 4 and 7 months of treatment, the bite plane can be removed. (G) Orthodontic corrections were then completed while consulting the general dentist to find out precisely in which position he wanted the anterior teeth to be to make it easier for him to restore the teeth after the orthodontic treatment. In this case, it was necessary to “move up” (intrude) the upper incisors even more to give the gingival tissue a better esthetic contour. To learn more on smile esthetics and “gingival contour”. (H) End of orthodontics: Once the orthodontic appliances are removed, the change in the vertical dimension can easily be noticed; the incisors do not have any overbite at all (compare with the overbite before the treatment in (A)). (I and M) The edges of the incisors in both arches are not aligned and uneven, but the teeth were placed that way to improve the gingival contour esthetics. The dentist plans to restore the teeth afterwards, so dental esthetics is not a priority at this stage. (J and K) Dentition prior to the orthodontic treatment with an edge-to-edge relationship (J) with the mouth open (K) and after the orthodontic corrections (L) with the mouth open. After the end of the orthodontic treatment, the dentist takes over and will make the crowns on the anterior teeth (6 upper and lower front teeth) and will thus make it possible for the teeth to obtain optimal function and esthetics. (N) Crowns on the 6 upper and lower anterior teeth (O). (P) Final occlusion with the final crowns. (Q) Occlusal view of the upper arch with the crowns. 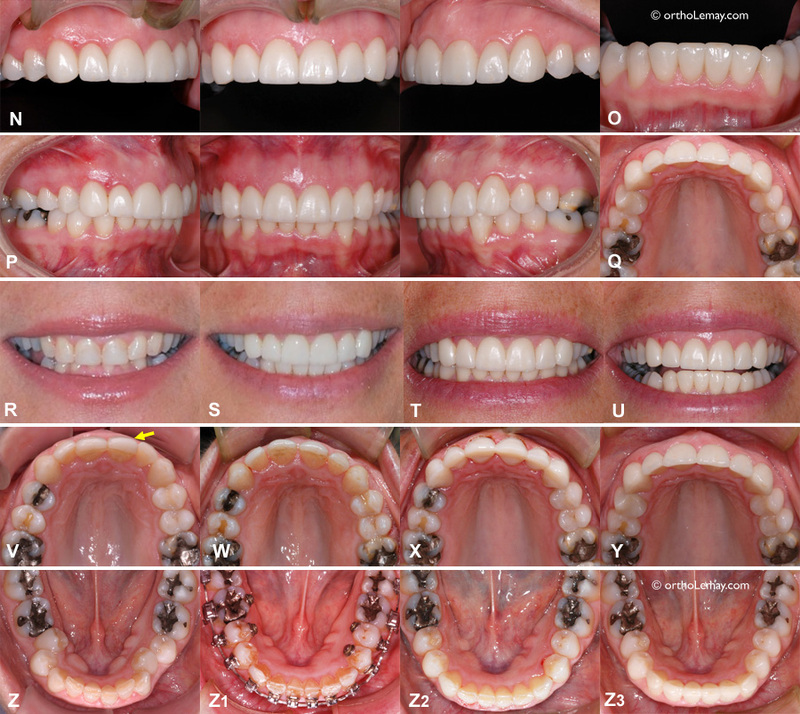 (R) Smile before and after the treatment with the crowns (S, T, U). (V) Before treatment; the arrow indicates a composite build-up that was added on the left central incisor to hide a rotation of that tooth. This composite was removed to bring the tooth to its ideal position during treatment (W). (W) End of the orthodontic treatment; the composite was removed, the corrections were completed and interdental spaces are present to allow the general dentist to make prosthetic crowns of optimal dimensions. (X) With the temporary crowns in the mouth that were replaced by final ceramic crowns later (Y). (The difference in appearance of the incisors on the pictures X and Y is due to the different angle used for the pictures). (Z) Lower dentition before the orthodontic treatment; the arch is narrow, irregular and there is not enough space to lodge the teeth in the dental arch. 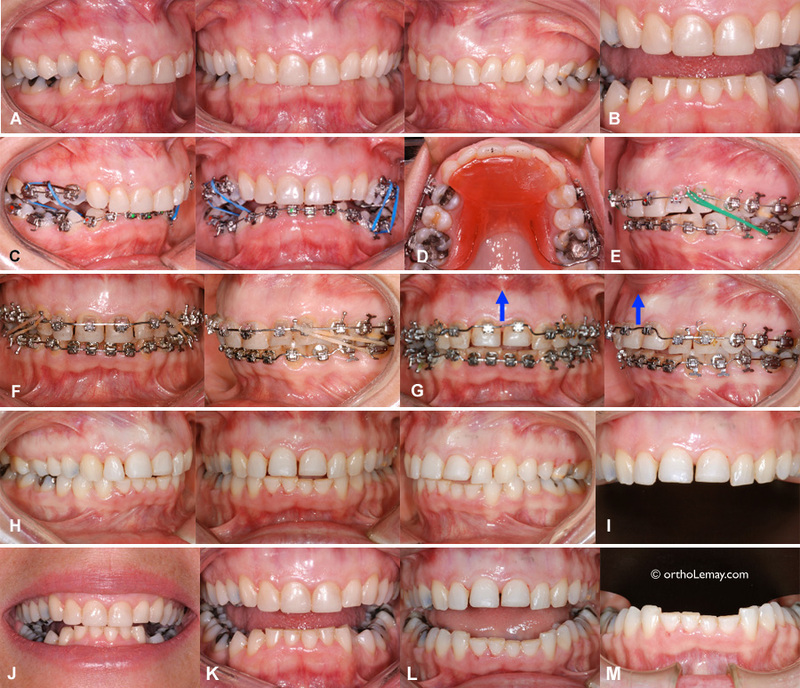 (Z1) During the orthodontic corrections with the fixed orthodontic appliances (“braces”) in the mouth. It is easy to see that the edges of the incisors are severely worn. (Z2) At the end of the orthodontic treatment after the corrective appliances (“braces”) were removed. (Z3) After the final crowns were made and placed on the 6 anterior teeth. In conclusion, correcting a severe malocclusion with an excessive overbite and significant dental wear is only possible with an approach involving several disciplines of dentistry, such as orthodontics, general dentistry, prosthodontics, periodontics, etc. A general dentist could not accomplish anything valid or significant in such a case without orthodontics and the orthodontist could only reposition the teeth, correct the occlusion pattern that contributes to dental wear, but could not give a smile as esthetic and functional without restorations performed by the general dentist after an orthodontic treatment. It is the essence of inter-disciplinary collaboration in dentistry.